This December, franchisee Michael Meeks is having his very own 12 days of Christmas, TapSnap-style. 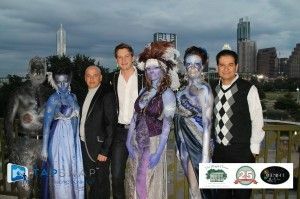 Michael Meeks donated his TapSnap services for the Midnight in Paris Gala for the Wright House Wellness Center. “In the days leading up to Christmas, I’ve got 12 holiday parties and one graduation party,” he says. And he’s not done taking bookings yet. TapSnap provides great entertainment at corporate and private holiday parties (as well as any other special event) by allowing event guests to take their own pictures with a touch of a fingertip to the giant 42-inch touchscreen, and share their photos instantly on social media. For the holiday season, TapSnap has an array of themed digital props like elf hats and reindeer ears, as well as holiday themed green screen backgrounds, which allow event guests to change the background of their picture to festive winter scenes, like a hearth with a Christmas tree and more. It’s going to be very busy, and Michael wouldn’t have it any other way. He’ll be taking his TapSnap machine to a Great Gatsby-themed soiree for 1,200 guests of Electronic Arts’ BioWare division, a 1920s black and white party for a health care association, a party for Austin Federal Credit Union, a legal office party for 250 people and many more. 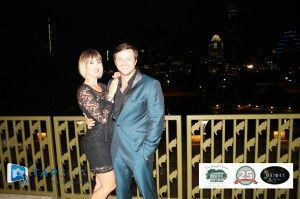 Another glamorous photo from the Midnight in Paris gala. Michael is the kind of person who stands up for his community, who goes out in the middle of a stormy winter night to fix the leaky roof at the church, as he did earlier this month. Prior to launching his TapSnap business, he worked in cyber-security. Now he’s pulling out all the stops to build his TapSnap business, for his family and the future. “TapSnap is a new franchise and I’m going from zero to 100 as fast as I can. This holiday season is going to be my biggest party ever,” says Michael.